205 players took their shot today in the $2,700 main event and at the end of the day 126 will return for day 2. Registration is open until the end of the first level tomorrow morning. 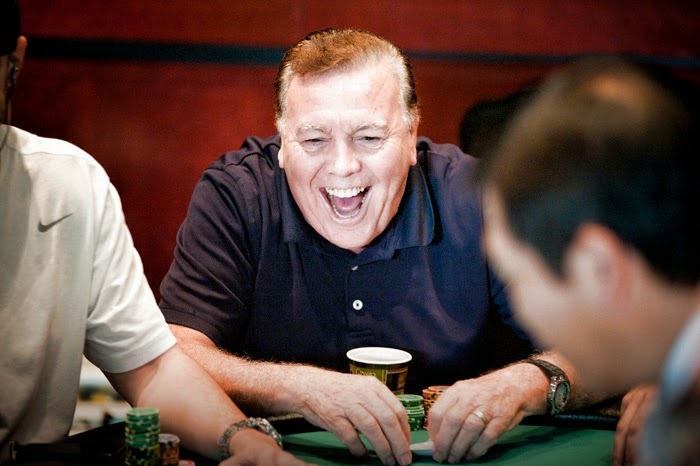 Players will recieve 30,000 in chips with the big blind being 600. Table draw and chip counts will be posted shortly. Three players saw the turn on a [Kd][7h][8d][9h] board when Bart Guthrie pushed his remaining 29,205 into an already bloated pot. 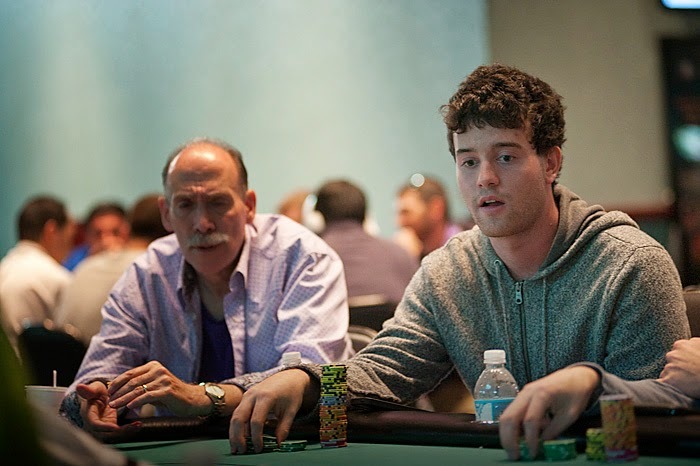 After a few minutes of tanking, both players released their hands and Guthrie would rake in the pot and chip up to over 45,000. There is 15 minutes left in day 1 of event 18! 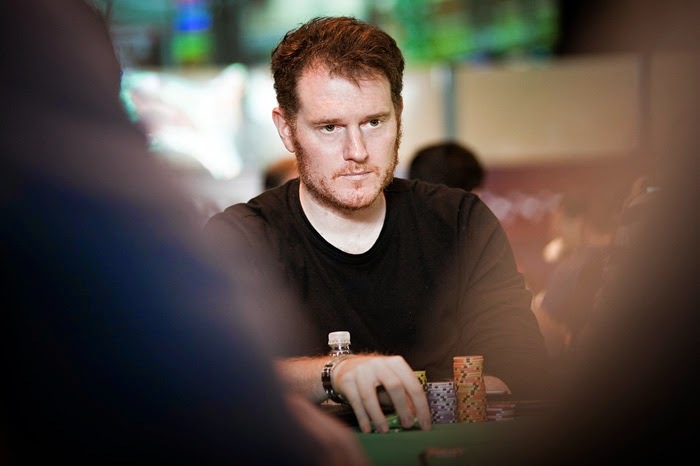 Action was checked to Kevin Calenzo on a [3c][7s][6c][Qc][6h] board and he fired a bet of 4,525 into an already bloated pot. His opponent tank called and Calenzo tabled [Kc][Kd]. The opposing player knuckled the table and threw his cards in the direction of the muck as Calenzo raked in the pot. Kevin now sits on over 60,000 chips. Players are coming back from their last break of the night to play the final two levels of the day. So far 194 players seats have been sold and with registration open through the end of level 9 tomorrow morning, that number will continue to grow. Among the top of the chip counts returning from break is Andy Frankenberger. Frankenberger has been steadily chipping up all day peaking around 95,000, but after a few unfortunate rivers he currently sits with 73,000. 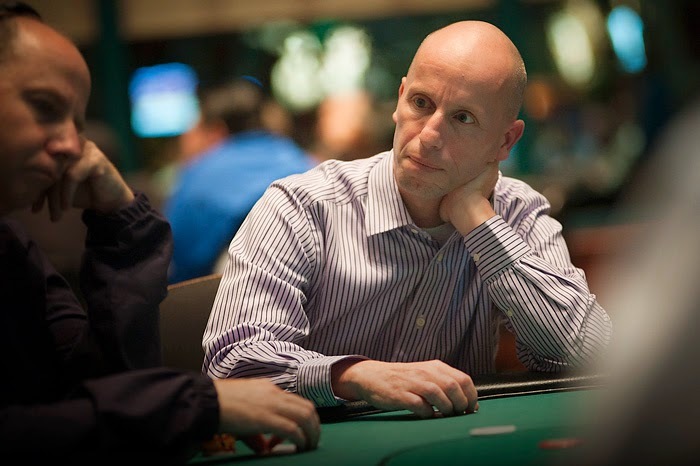 As we were walking around the room to gather chip counts Tim Reilly had called us over to say that he had a feeling it was about to a big pot. 4 players, Reilly included, saw a flop of [9h][2s][7s] and the action was checked to Richard Tuhrim who led out for 1,100. Reilly called and the small blind put in a check-raise to 3,600. The player in early position folded and it was back on Tuhrim and he put in a four-bet to 8,600. "I should just jam because of what I said about this hand" Reilly said as he threw his cards into the muck. The small blind quickly called and we were heads up to the turn. The small blind checked his action when the [5h] hit the turn and Tuhrim quietly pushed his remaining chips into the middle with both hands, good for an all in bet of 16,975. The small blind crossed his arms and sat back in his chair after he cut out the chips to call and left them on his cards. "Can I see the next card?" He asked the dealer. After a few minutes he eventually released his hand into the muck. "Should I show it?" Tuhrim asked, and after some encouragement from Reilly he tabled the [Qs][10s]. Players will be on their last 15 minute break of the day after this level. 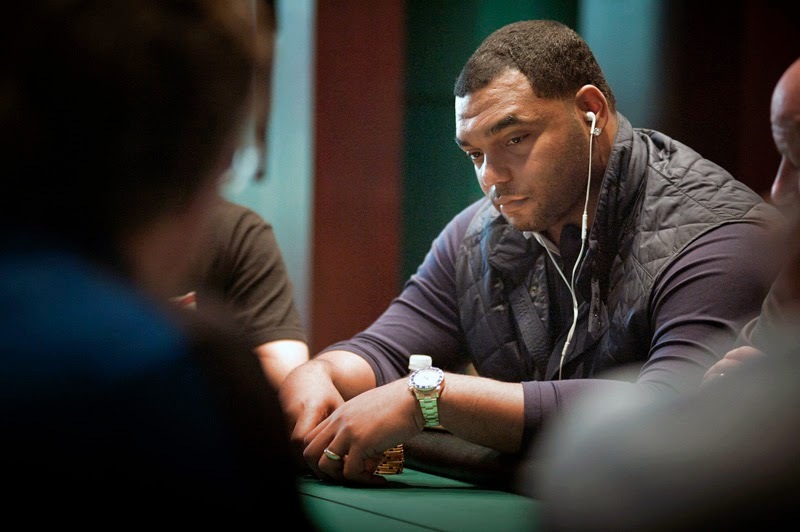 3 time Super Bowl champion Richard Seymour is now seated at table 11 in the tournament area. Seymour has played in seven Pro Bowls, has been named to three All-Pro teams, and has been a member of three Super Bowl-winning Patriots teams. Some have considered Seymour to be the best defensive lineman in the NFL and we will how he shapes up on the felt. Seymour now sits with around 35,000. Players are now on their second 15 minute break of the day. There are currently 177 players registered. 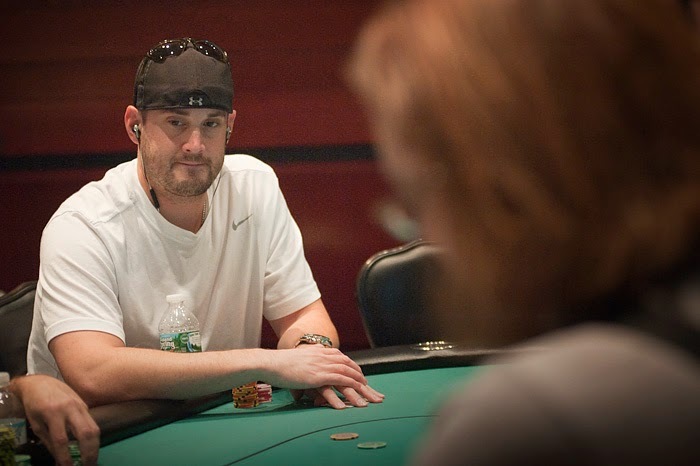 As more players take their seats here on day 1, we noticed a very familiar face join table 9. 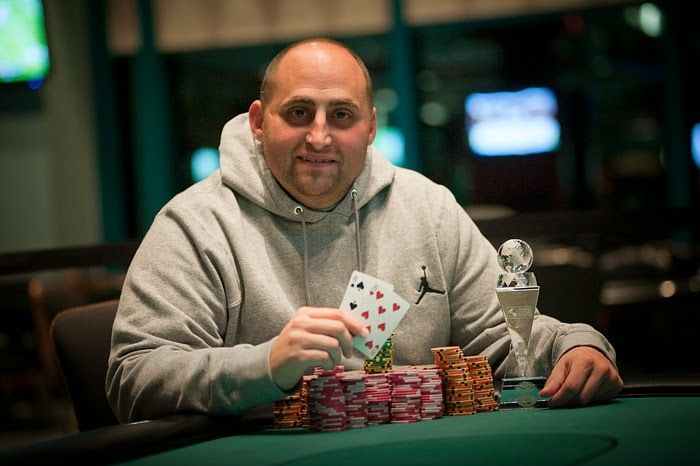 Jason Calnan has already taken home 2 globes this series and has his eyes set on number 3. Less than 24 hours after winning event 15, Calnan has joined the field in event 18. Players will be on a 15 minute break at the end of this level. Omar Aguilera is enjoying day 1 of the main event. If you hear a loud commotion in the tournament area there is a 99% chance it is coming from table 14. Omar Aguilera has the entire table hysterical with his antics. He has been all in three times in the past orbit and is actually chipping up quite nicely, but definitely is not flying under the radar. In the latest hand he announced he was all in on a [5c][3s][3d][9h] board. "Everyone knows what I have, so I go all in!" After his opponent folded he flipped over the [8d]. "Oh would you look at this!" he said as the table broke out into laughter. "Unbelievable!" he yelled as he flipped up the other card which happened to be the [3c]. Players have 5 minutes left in level 3. 65k from 30k @FoxwoodsPoker $2700 Main Event after 2 lvls. Glad I hustled and got here on time. So far 134 players are registered and play is scheduled through the end of level 8 tonight. Event 18: $2,700 NLH Championship Is Underway! 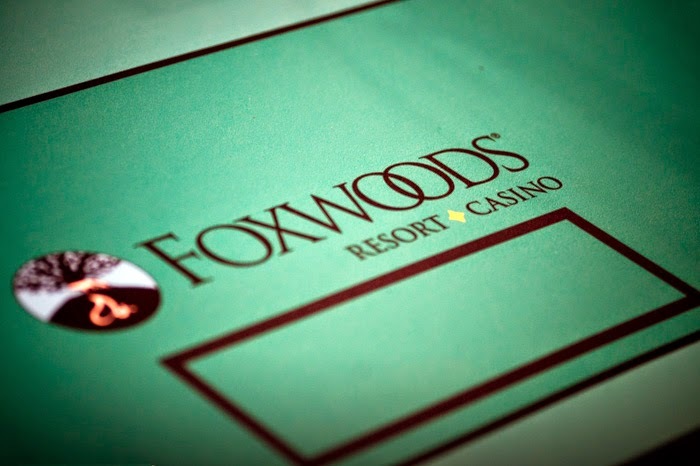 We are officially underway in the 2014 Foxwoods World Poker Finals Main Event. 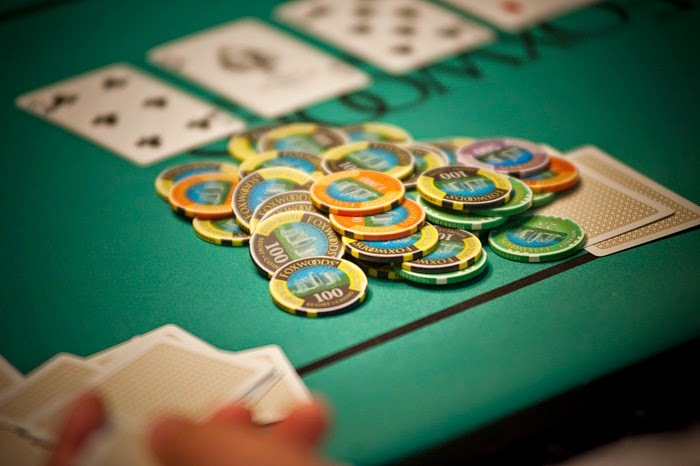 This $2,700 no limit hold'em event is schedule to play through the end of level 8. Registration is open until the end of level 9, which is the first level on day 2.